Are you a Fan of the Greek Gods? I am a huge fan of the Greek Gods. I think Greek Mythology is a fascinating subject! It is so interesting to learn how the ancient Greeks formulated all the answers to all of Nature mysteries and wonders by their beliefs in the Greek Gods! Now you can have your favorite Greek Gods figurines or statues right in your living-room! Ancient Greeks believed the Greek Gods were responsible for every single natural phenomenon that happened on Earth! 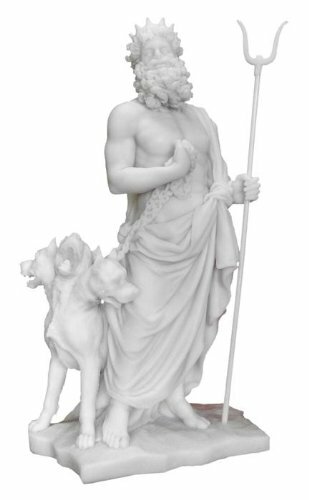 Greek God figurines and statues make excellent gift ideas for Greek Gods lovers and fans! They are very beautiful and very unique! Here I gathered a few of the most interesting Greek Gods statues in case you are interested in starting your own Greek God Statue collection! These are beautiful pieces and I think having real Greek God statues around the house plus a good book, is a great way to teach your children or grandchildren about the mighty Greek Gods! Which is your favorite Greek God or Greek Goddess? Back in ancient Greece, Greek people believed in several Gods. They usually had a God for almost everything in Nature. Their Gods looked almost exactly like regular mortals, except they could not die and were taller and more beautiful. *Zeus was the father of the Gods! He is the most important Greek God, so you are obviously going to want to have his statue! They lived on top of the highest mountain that ever existed, called Olympus and they ruled from there. Sometimes they would descend to Earth and interact with the humans, but often disguised as animals or other shapes. Zeus was the lord of the Universe and he shared his powers with his brothers and sisters in Olympus. He ruled the Olympians and he was the God of the sky and thunder…. They all sat side by side. There were twelve great Gods and Zeus sat on the highest throne! 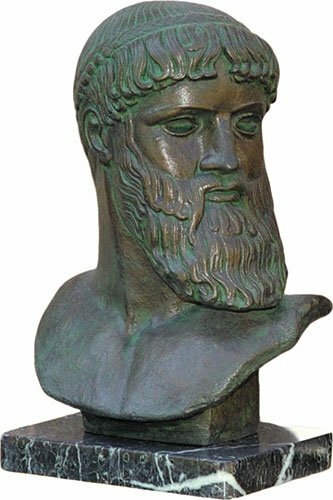 This is a gorgeous and very impressive Zeus bust for sale! She was the Queen of the Greek Gods because she was married to Zeus! She was ‘in charge’ of everything on Earth, specially the weather and the seasons! This is a beautiful and very affordable 10 inch Greek Goddess Hera figurine for sale! She has an amazing bronze finish! Perfect to start your collection! 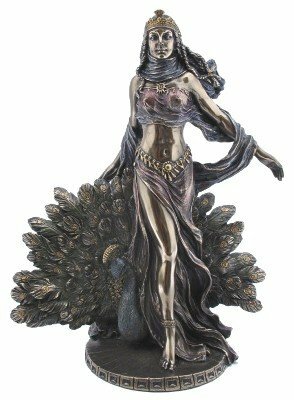 Aphrodite: Greek Goddess of Love Statue! Aphrodite was the beautiful Goddess of Love, beauty and sexuality! She was the only Olympian who didn’t have a mother or a father…. Nobody knew where she came from…. This is one of the most beautiful Greek Gods figurines I’ve seen! It is 12 inches tall and it has a beautiful and shiny bronze finish too! It is a must-have in your collection for sure! Greek Gods figurines make wonderful gift ideas for just about anyone! 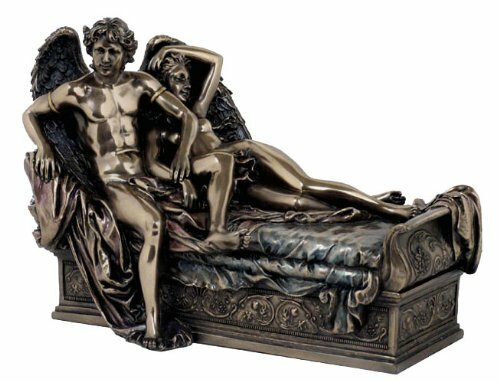 This is a very beautiful and exquisite statue of Cupid and Psyche! Venus (or Aphrodite) was his mom! This gorgeous Cupid and Psyche figurine is very detailed! Will look absolutely amazing in your collection! Hermes was the merriest of the Olympians and he was the God of shepherds, travelers and merchants. He was one of Zeus’s son. Hermes was also the great messenger of the Gods and a guide to the underworld! He brought messages from the Gods to the humans and was also believed to protect travelers! 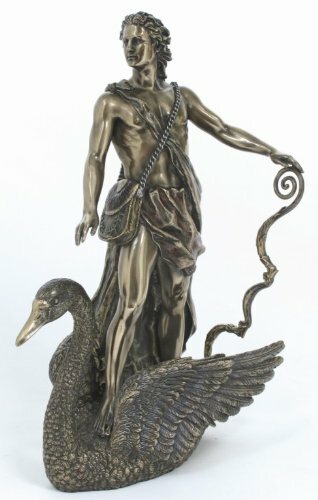 This is a gorgeous bronze figurine of the Greek God Hermes! The level of details is extraordinary! 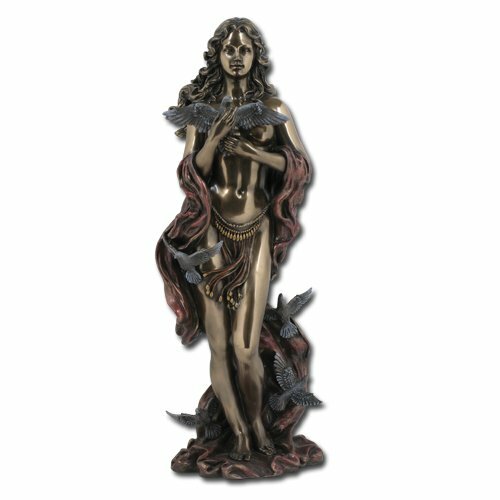 Best Greek Gods Figurines for Sale! Apollo was the God of light, music, medicine and healing! He could also bring illness and the plague…. His twin sister was the Goddess Artemis. This is a gorgeous and very impressive Apollo on swan statue! It is about 11 inches tall and makes a wonderful gift! Artemis was the Goddess of the moon and nature. She was also Apollo’s twin sister. She was imagined to be a huntress and always carrying her bow and arrows! 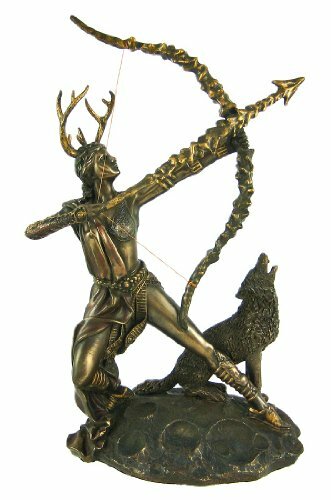 This is a beautiful and very rare statue of Artemis! She is about 10 inches tall and very affordable too! Poseidon: God of the Sea Tall Sculpture for Sale! Poseidon was the lord of the Sea! He was very moody and very violent! When he struck the ground with his trident, the earth trembled and split open! When Poseidon struck the sea, the waves rose mountain high! This is a magnificent piece! 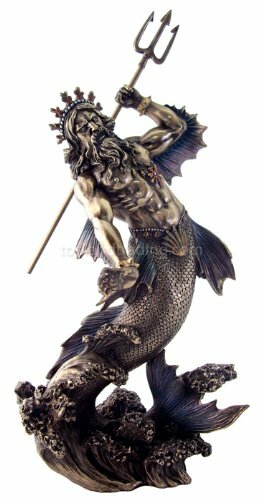 It is a life-sized, 5 feet tall outdoor Poseidon sculpture for sale! I can’t think of a better sculpture to have by your pool than this! 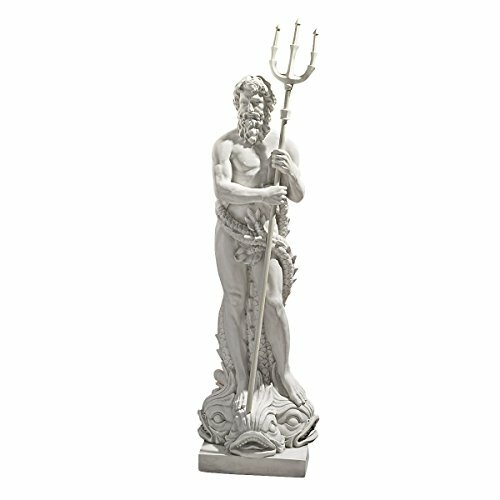 *Gorgeous Poseidon with Trident Figurine! 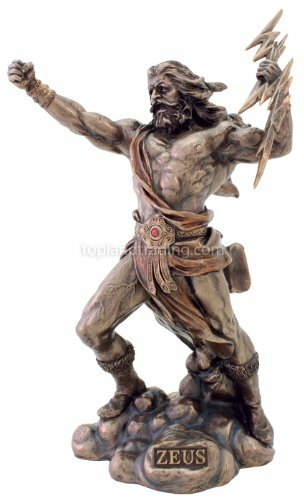 This is also a very impressive and incredibly detailed Poseidon with trident figurine for sale! He is furiously emerging from the waves and holding his trident pointing up! 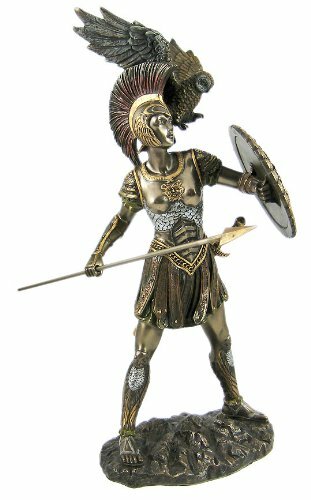 He stands approximately 11 inches tall and is another must-have in any Greek Gods figurines collection! Dionysus Greek Roman God of Wine Figurine! Dionysus was the God of wine and he was the youngest of the Olympians. He was the only one of the twelve Gods whose mother was a mortal! 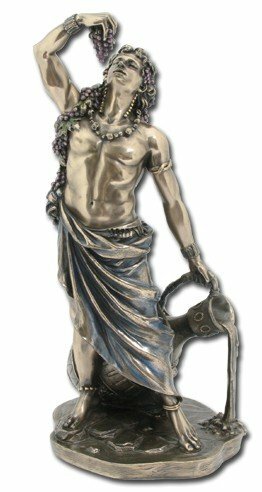 This is a very cool and affordable 11 inch tall Dionysus figurine for sale! He has a very nice bronze color and a cool ‘antique’ look! Great gift idea for any Greek Gods lover in the family! Athena was the Goddess of war and wisdom! She was Zeus’s favorite child and her mother was Metis, Goddess of Prudence and Zeus’s first wife. Another must-have to any Greek Gods figurines collection. She makes an awesome gift idea as well! Ares Greek GOD of WAR Impressive Statue! 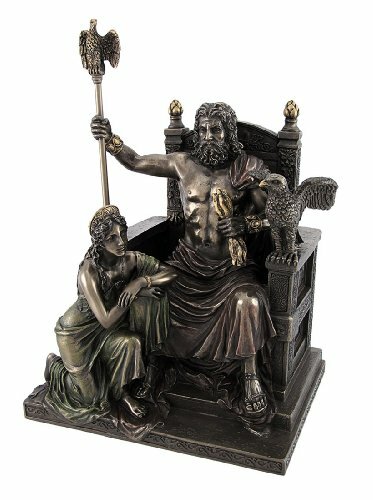 The Best Greek Gods Figurines to Collect! Ares was the son of Zeus and Hera. He was the God of War and he was very tall and very handsome! He was also extremely vain and cruel as well…. He was very dangerous and very destructive! 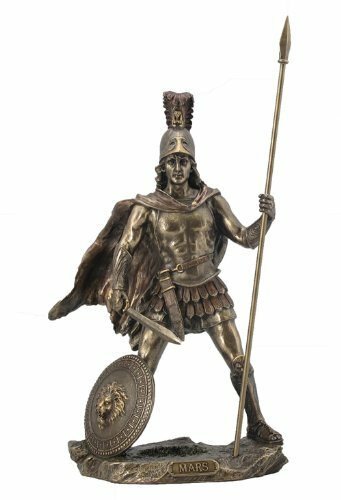 This is also an impressive statue of Ares and you will definitely want to have him in your Greek God statues collection! This is a stunning 13 inches tall Ares figurine to collect! Hades Lord of the Dead Unique Figurine for Sale! He was the eldest brother of Zeus and preferred to stay in his gloomy palace in the underworld. He never went to Olympus. Mortals never mentioned his name because they were very afraid of him…. Cerberus was his three-headed dog and guardian. This beautiful white statue is made of cold cast resin and it stands about 11 inches tall. Very cool piece to have in your collection! 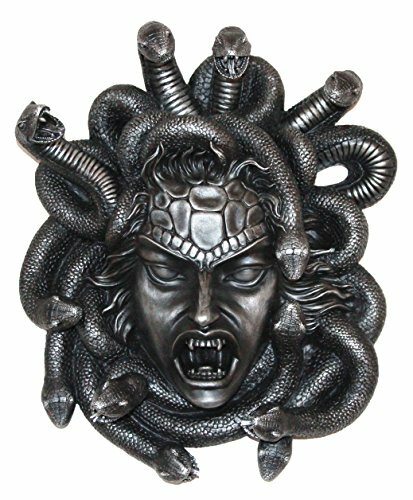 Of all Greek Gods figurines for sale this Medusa has got to be the scariest! Whatever you do do not stare into her eyes!! This is an impressive Medusa statue and if I were you, I would not look directly at her when you get her…. Beautiful Life Size Woman Sculptures for Your Garden!